Sussex all-rounder Luke Wright has signed a three-year extension to his contract, keeping him at Hove until the end of the 2018 season. 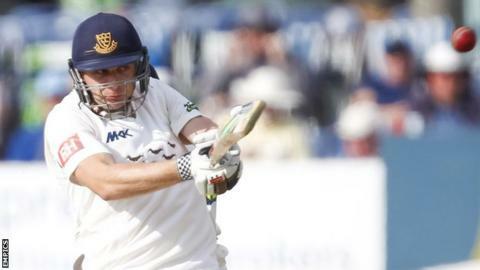 The 29-year-old, who joined Sussex in 2004, scored 933 County Championship runs in 2014 and a further 893 in domestic limited overs competitions. "Luke has been in outstanding form for a period of time now," Sussex cricket manager Mark Robinson said. "For him to commit himself for the next four years is great news." Robinson continued: "He has long been seen as one of the leading one-day and T20 players in the world, but he has really come into his own in red-ball cricket in recent times as he matures into a more complete player." Grantham-born Wright has played 50 one-day internationals and 51 Twenty20 matches for England, but none since the T20 defeat by the West Indies in Bridgetown in March. Wright hit centuries for Sussex in all three domestic competitions last season, scoring 189 against Durham in the Championship and hitting an unbeaten 153 from 66 balls against Essex in the T20 Blast. Sussex finished third in the Championship table, but exited both the T20 competition and the One-Day Cup at the group stage. Having extended his contract and been granted a benefit year by Sussex for 2015, Wright is now eager to challenge for more silverware. "I absolutely love this club," he said. "I was really proud of my performance last year but it is only really satisfying when that contributes to winning trophies. I truly believe we will over the next four years." Wright is the second Sussex player to sign a new contract this week, following opening batsman Luke Wells, who has agreed a deal to the end of the 2016 season.